The book investigates the impact on the competitiveness of cities developing creative industries (arts, media, entertainment, creative business services, architects, publishers, designers) and knowledge-intensive industries (ICT, R&D, finance, law). It provides significant new knowledge to the theoretical and practical understanding of the conditions necessary to stimulate "creative knowledge" cities. The editors compare the socio-economic developments, experiences and strategies in 13 urban regions across Europe: Amsterdam, Barcelona, Birmingham, Budapest, Dublin, Helsinki, Leipzig, Milan, Munich, Poznan, Riga, Sofia and Toulouse. These have different histories and roles; include capital and non-capital cities of different sizes; represent cities with different economic structures; and different cultural, political and welfare state traditions. 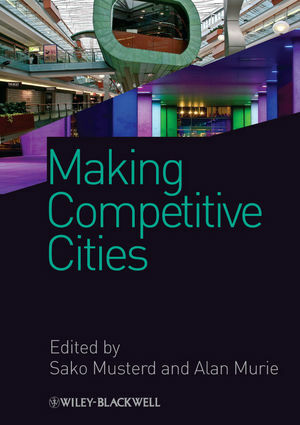 Through this wide set of examples, Making Competitive Cities informs the debate about creative and knowledge-intensive industries, economic development, and competitiveness policies. It focuses on which metropolitan regions have a better chance to develop as "creative knowledge regions" and which do not, as well as investigating why this is so and what can policy do to influence change. Chapter authors from thirteen European institutions rigorously evaluate, reformulate and empirically test assumptions about cities and their potential for attracting creative and knowledge-intensive industries. As well as a systematic empirical comparison of developments related to these industries, the book examines the pathways that cities have followed and surveys both the negative and positive impacts of different prevailing conditions. 4 Stable Trajectories Towards the Creative Knowledge City? Intensive Industries: What Determines Their Location? Policymaking: ‘soft’, ‘hard’ or ‘other’? Insecure, casualised or long-term, sustainable employment? 13 What Policies Should Cities Adopt?